SAW046342 SCOTLAND (1952). Glasgow, general view, showing Eastern District Hospital, Duke Street and Cattle Market, Bellgrove Street. An oblique aerial photograph taken facing south. This image has been produced from a crop marked negative. Title [SAW046342] Glasgow, general view, showing Eastern District Hospital, Duke Street and Cattle Market, Bellgrove Street. An oblique aerial photograph taken facing south. This image has been produced from a crop marked negative. Dennistoun Blackfriars Church of Scotland. 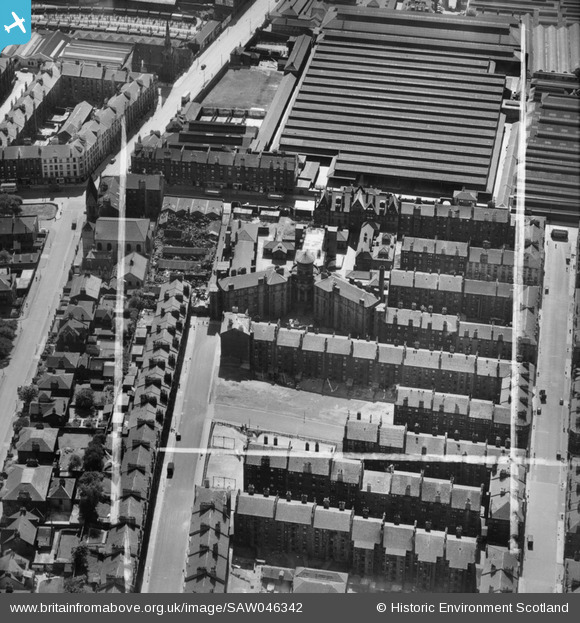 Gallowgate Meat Market at Graham St.
Solitary small building left standing?